Walk down the center aisles of any supermarket and you will be surrounded by cartons, cans and jars that represent our modern diet. Processed, prefabbed foods, perennially ready to eat, warm up, dine out, dash in – for those on the go. If you don’t see the USDA Certified Organic or Non-GMO Verified label, you can count on GMO ingredients inside those containers. The Grocery Manufacturers Association (GMA) estimates that more than 75% of those packaged, processed, center-of-the-store foods contain genetically modified ingredients. What in the world are they and what is all the fuss about? GMO’s, genetically engineered or altered, are living organisms that have had their DNA changed in ways that do not occur in nature. A scientist in a laboratory uses radical, often brutal techniques, be they chemical or mechanical, to force the DNA of one species into the DNA of an entirely different species. 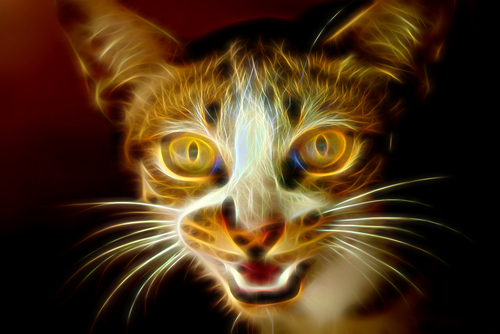 Think strawberry and fish or cats injected with fluorescent proteins that make them glow in the dark. Consider goat and spider DNA married in an unbiblical way. This is very different than traditional cross breeding or hybridizing plants and animals. It’s obvious that these combinations could never exist outside of the lab, yet the FDA and EPA don’t recognize them as substantially different. 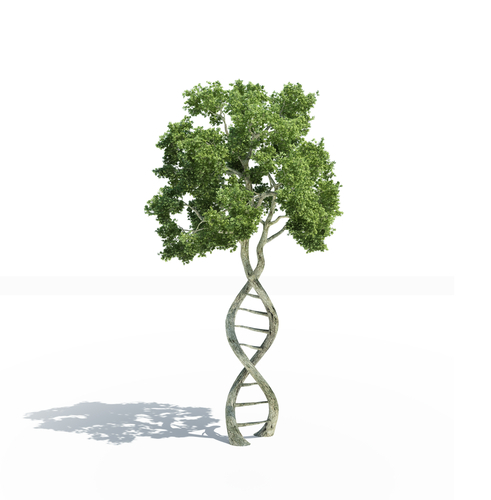 Genetic engineering forcefully alters the natural occurring barrier between species, creating new living patented entities that have the potential to be unstable. Among the most common examples of GMO technology is corn and soy mixed with the DNA of insecticidal bacteria, or combined with DNA to make them resistant to herbicides. According to The Center for Food Safety, over 90% of corn, soybeans, cotton and cottonseed oil are genetically modified in the U.S. Other common GMO foods in the aisle are canola oil, Hawaiian papaya, sugar made from sugar beets, high fructose corn syrup and squash. Don’t overlook potatoes and apples that won’t brown so you can’t tell how old they are. Chances are, if you live in the U.S., you have ingested genetically modified organisms more than once and probably often. But as consumers wake up to the GMO’s in their grocery cart, the biotech industry is already going beyond to a new generation of even more extreme genetic engineering techniques that promise to change life faster, cheaper and in more fundamental ways. This new basket of genetic tools comes with its own set of acronyms, but at root it’s just the same genetic engineering mindset on steroids. Take for example CRISPR – that’s a new gene-editing tool that radically alters the traits of insects and plants and has been called the biggest biotech breakthrough of the century. Using CRISPR, scientists are now developing powerful genetic ‘instructions’ known as ‘gene drives’ that have the potential to aggressively spread and re-engineer entire populations of a species in a very short time or even to eradicate whole species. Good for us if we are looking to wipe out pests and disease, but troubling if accidental release from labs occurs, because these “super” organisms could spread rapidly and cause health and environmental disasters. Twenty-seven esteemed scientists weighed in calling for strict controls and caution. Meanwhile, technology continues to race forward. One of the newest and most “promising” according to Monsanto is an emerging technology that can alter the genes of plants just by spraying them with RNA. This is not technically a genetically modified organism, but it does indeed control their cell structure. No one knows how this technique of modifying cells with a sprayer will affect other plants, animals and the humans that ingest it. 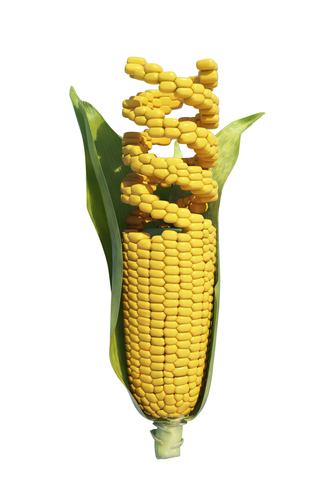 “The Next Great GMO Debate” in the MIT Technology Review offers more insight. The next landscape that genetic tinkering is literally cavalcading into is the hidden world of algae and yeast. In fact, that horse left the barn quite a while ago. With synthetic biology, scientists have figured out how to genetically modify algae or yeast so it “manufactures” unique substances like meat, leather, egg whites and milk. Modern Meadows is producing vegan leather and plans to grow vegan meat. Clara Foods will be serving up egg whites without the chickens and Muufri (“moo-free”) has manipulated yeast cells to excrete cows milk proteins, doing away with the inconvenience of dairy farming. .Supporters call it a way to avoid animal welfare issues and the detrimental land, water and chemical effects of meat production, but these new synthetic animal products will still require agricultural inputs (mostly sugar) and represent a further industrialization of our food chain. How can this novel way of producing food and products be totally unregulated and untested for long-term environmental, social and health ramifications? Genetic engineering has gained quite a toe hold in almost every corner of our lives. Whether we eat from the center aisle of the supermarket, walk down that manicured golf course or one day fondle that vegan leather purse, genetic tinkering is increasingly all around us. 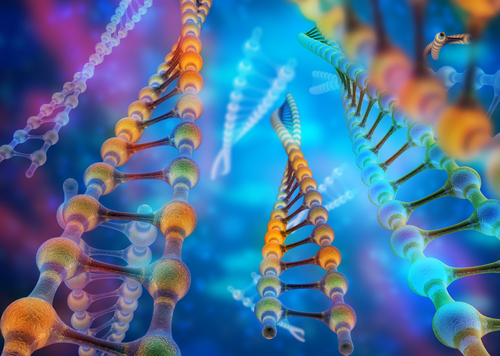 As a species, we are changing the very core of life through our entrance into the world of DNA and RNA. In evolutionary terms, it’s an unprecedented moment that life itself has become an industrially-manufactured product. 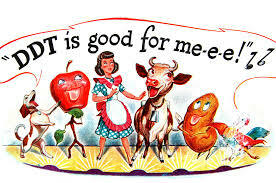 You may be too young to remember the ad “DDT- is good for me.” Let us not forget this image. One of the original producers of DDT was Monsanto, and they are still at it, promoting technologies before we fully know their long-term implications. This entry was posted in GMO, Social Implications in Agriculture, What is Organic and tagged Genetic engineering, GMO, Synthetic biology. Bookmark the permalink. ← Will Organic Agriculture Ultimately Feed the World? As a beek, (beekeeper in Los Angeles using feral, partially Africanized bees) it is always interesting to see how the GMO promoting crowd wants to focus ONLY on the impacts, or no impacts, to the human body. The failure to address the impacts to the soil food web caused by the heavy use of industrial chemical agriculture, in concert with GMO crops designed to resist certain of the herbicides, is irresponsible, reckless and willfully blind. The soil food web is the ecosystem that makes possible the transfer of micronutrients and growth of beneficial protective organisms such as nematodes, bacteria, fungi, and protozoa. The chemically intensive model of agriculture the world has adopted has been quickly destroying this thin layer of fertile, bio-rich topsoil, yet all the Homo sapiens want to discuss regarding the Green Revolution and the beauty of GMO crops is whether or not this new model DIRECTLY affects the human body. The picture is bigger and more complex that that. It sickens me we are so ignorant. Absolutely amazing, and eye opening article about what GMO really means to us as a society. Lots to think about here. And it’s why we’re “Always Organic”. There are no GMO’s in certified organic produce.